I can always use more birthday cards on hand plus I wanted to use this set and the papers before they retire. 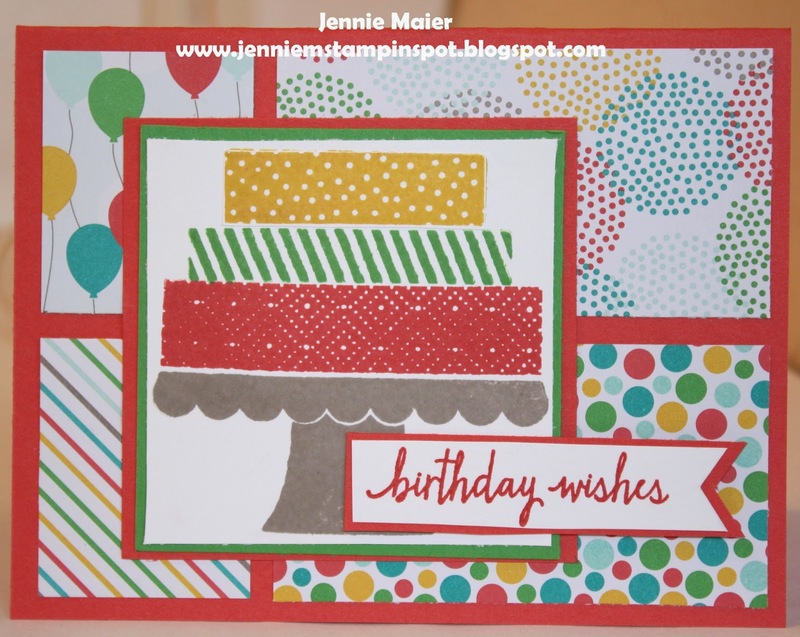 Balloon Bash is the stamp set and there's some Birthday Bash Specialty DSP. I also used the Freshly Made Sketch#188 here. 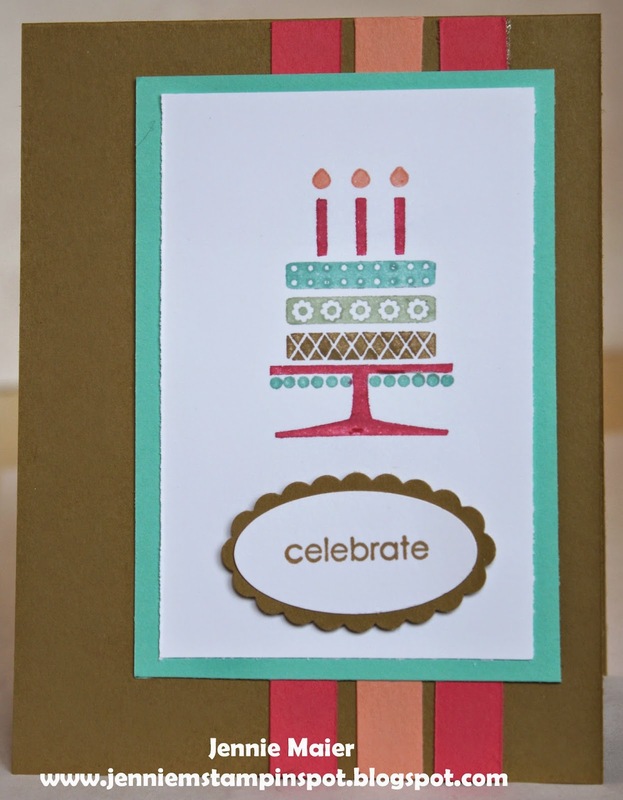 This is a quick birthday card for the Splitcoast Sketch#542 here. I used the retiring stamp set, Blue Ribbon with the new Cherry on Top Designer Washi Tape and Cherry on Top DSP Stack. This card is for two challenges. First, the Sweet Sunday Sketch Challenge#270 here. And second, the TGIF Challenge#04 here. It's an inspiration picture and the flowers with the Rose Red and Blackberry Bliss and some Daffodil Delight stood out to me. 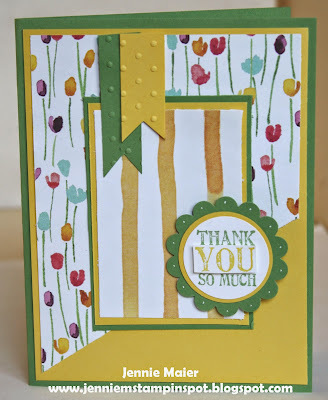 I used a retiring stamp set, Label Love with some retiring Painted Blooms DSP. Hope everyone enjoyed their long weekend! Ours was good, kicking off my son's baseball season, some good pizza with good friends, more baseball watching the nephews and some yardwork and housework. And I got time to play with the MojoMonday Sketch#399 here. 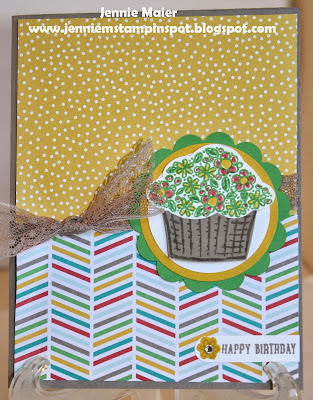 Sprinkles of Life is the stamp set with some Cherry on Top DSP Stack. This card uses some retiring products. And it's also for two challenges. First, I used the PPA Challenge#252 here. And second, the Create with Connie and Mary Challenge#356 here. 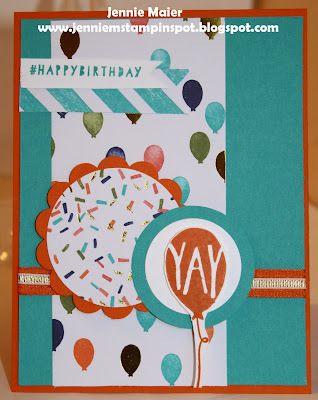 This one's a color challenge to use Blackberry Bliss, Soft Sky and Smoky Slate. The two stamp sets are retiring and they're Mixed Bunch and Lots of Thanks. Moonlight DSP Stack will be gone and so will the Blossom punch. This card is for the Freshly Made Sketch#187 here. 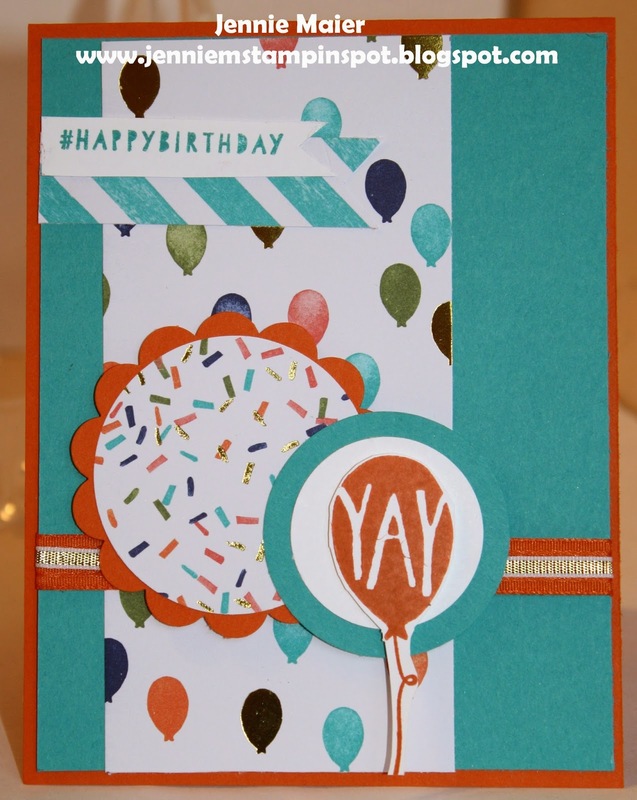 It uses two stamp sets, Balloon Bash and Remembering Your Birthday. Also uses the Apothecary Accents Framelits(retiring) with the Paper-piercing Pack Essentials(retiring) and some Sweet Taffy DSP (retiring). 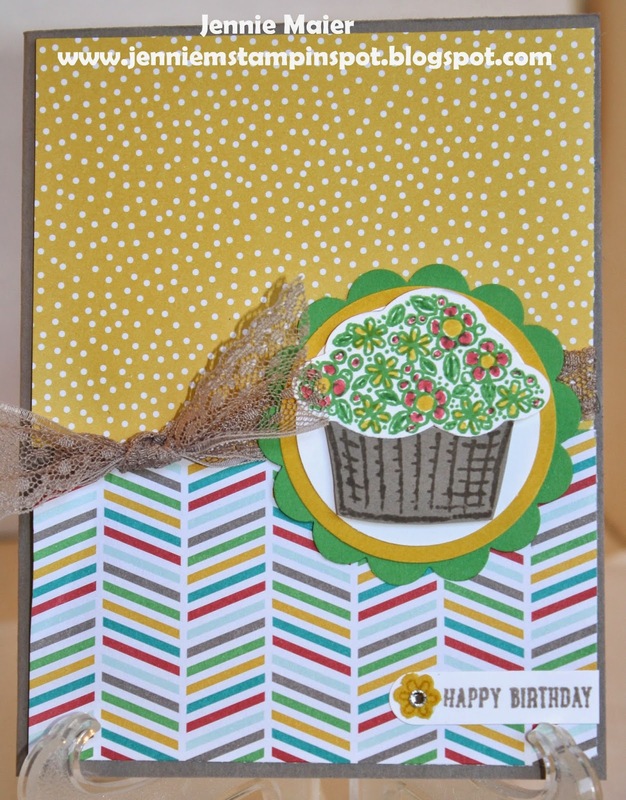 This card is another sneak peek using the Sprinkles of Life stamp set with the coordinating Tree Builder punch. I also used new papers, Cherry on Top DSP Stack and some 2015-2017 In Color Envelope paper and the Banner Triple punch. My inspiration was the MojoMonday Sketch#398 here. For this card I used another sketch challenge and color challenge. 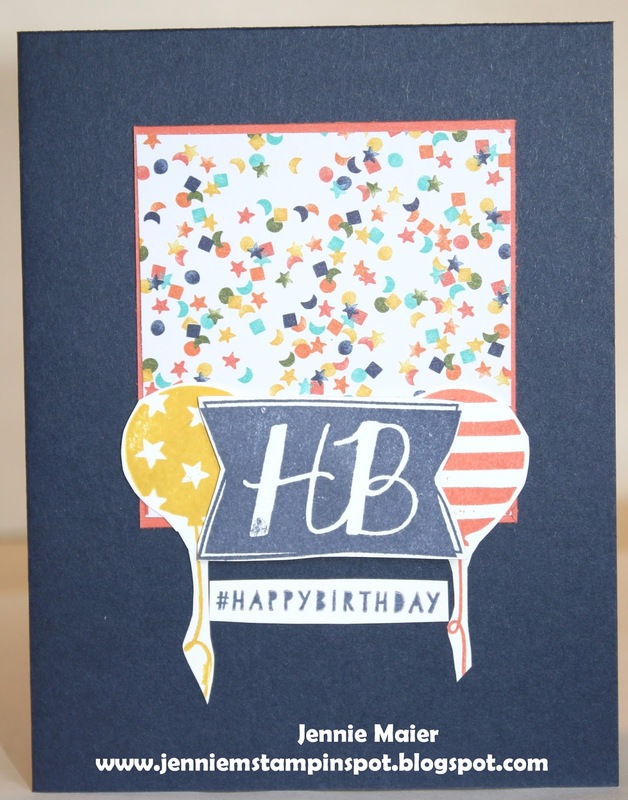 First, is the Hand Stamped Sentiments#212 here. And second the Splitcoast Color Challenge#531 here. There were 5 colors total but I chose to use three, Hello Honey, Basic Gray and Lost Lagoon. I mixed some old with new too. The new is a stamp set called Friendly Wishes( the big sentiment) and then A Fitting Occasion and Moonlight DSP Stack that will retire. 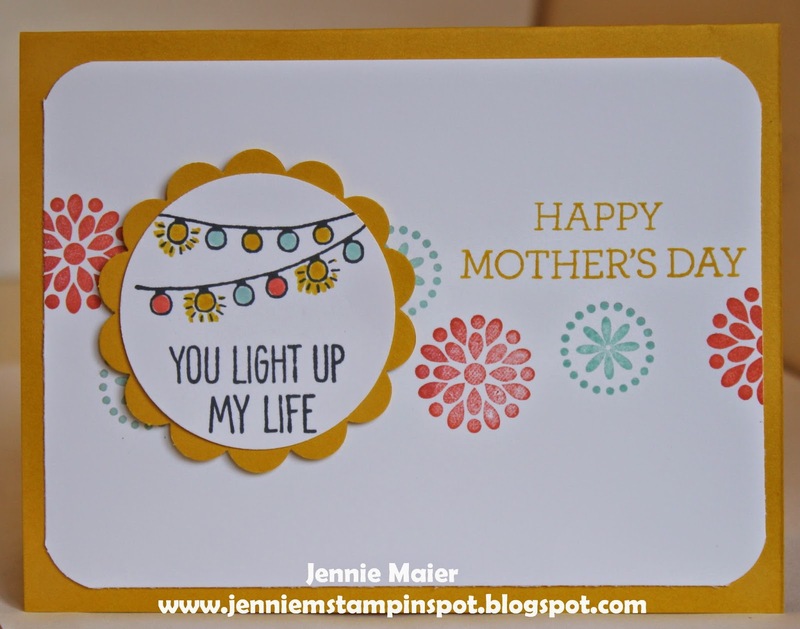 I also used two other stamp sets, Crazy about You and Something to Say. I keep plugging away at those graduation cards so this one would qualify for the TGIF Challenge#03 here. 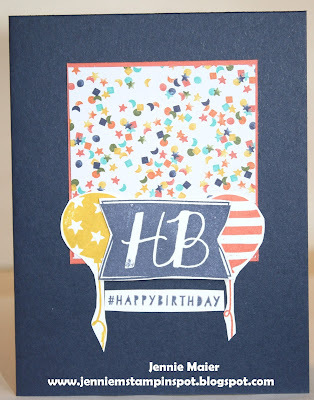 Blue Ribbon is the stamp set with some Cherry on Top DSP and some Typeset Specialty DSP. Also used the new Banner Triple punch making those banner ends sooo simple! Back to the Double Duty Cards! 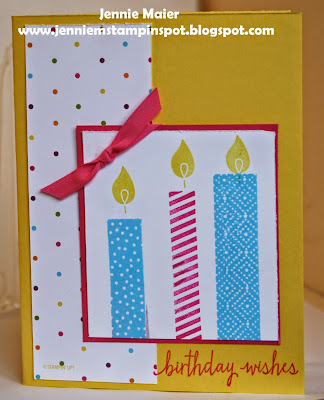 This super quick card came together thanks to the FabFri #64 here, a sketch challenge, and the PPA#251 here, a color challenge. 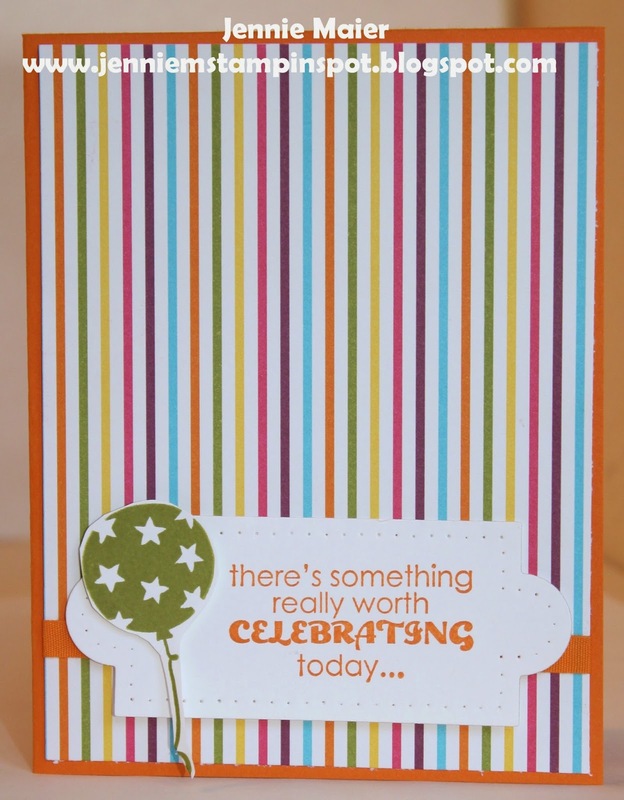 The colors to use are Daffodil Delight, Melon Mambo and Tempting Turquoise. 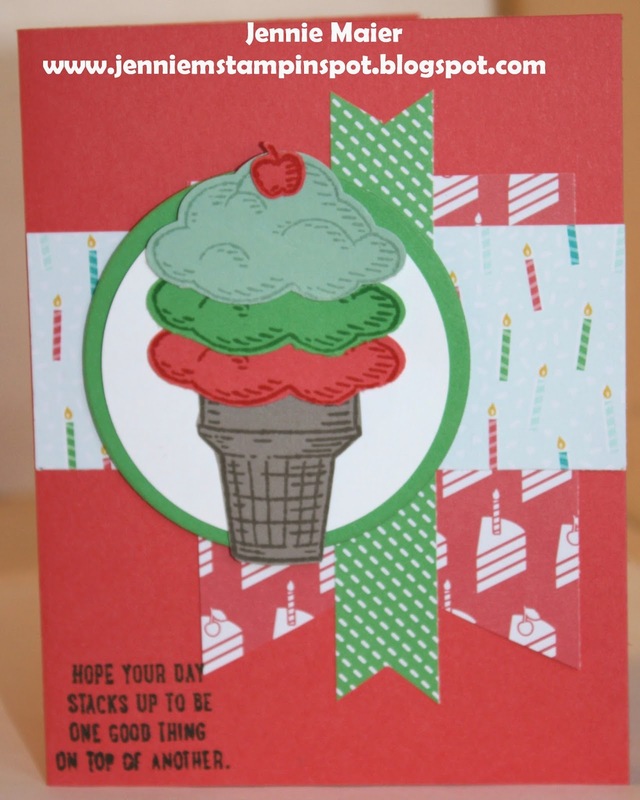 Build a Birthday is the stamp set with some Sweet Taffy DSP. 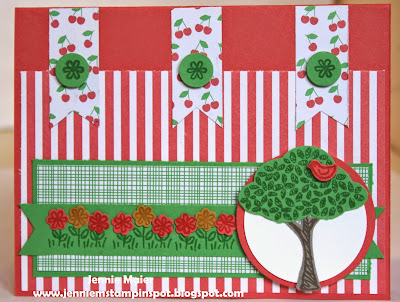 I had the Sprinkles of Life set out along with the Cherry on Top DSP Stack so I made this card using the Create With Connie and Mary Challenge#355 here. I got another chance to play with my sneak peek order! For this card I used the new Ronald McDonald House Charities' stamp set, Sprinkles of Life. It is the cutest set and with every purchase $3 is donated to the charity. It also has a coordinating punch, the Tree Builder punch. And I had to use some more of the Cherry on Top DSP Stack. Then there's some new 1 inch Tip Top Taupe Sheer Lace Trim. Oh, and I also used the Freshly Made Sketch#186 here. My demo pre-order arrived so I had to crack open my new catalog goodies. 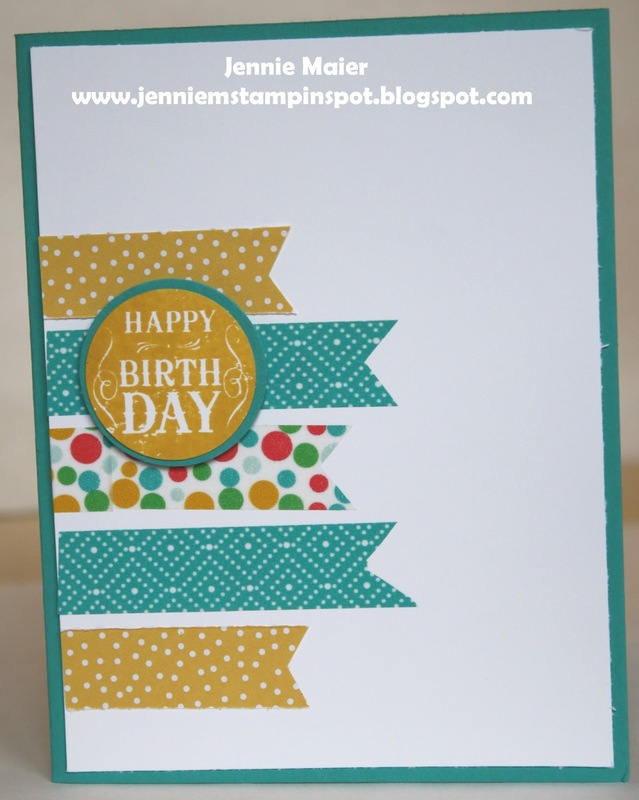 This features a new stamp set, Build a Birthday. There are also new 2015-2017 In-Colors: Cucumber Crush, Tip Top Taupe and Watermelon Wonder. And then THE BEST new DSP, Cherry on Top DSP Stack. It's also a new size-6 by 6 and I love every pattern! Finally, a new punch, Banner Triple Punch that has 3 sizes for banners! Hurry, these items are only around until June 2nd. 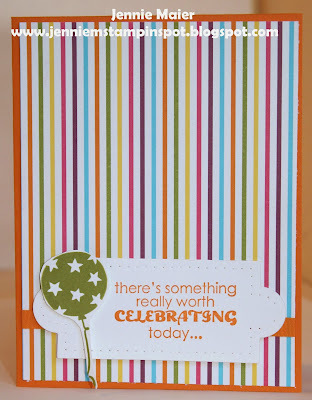 I used the Balloon Bash stamp set paired with some Birthday Bash Specialty DSP-they are both in the Occasions Catalog. I also used the MojoMonday Sketch#397 here, and the Create With Connie and Mary Challenge#354 here. 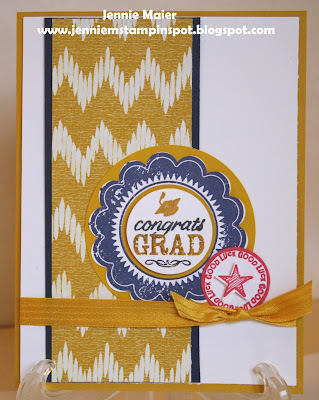 This one was a color challenge to use the colors Bermuda Bay, Tangelo Twist and Gold. So of course I thought of the Birthday Bash Specialty DSP! 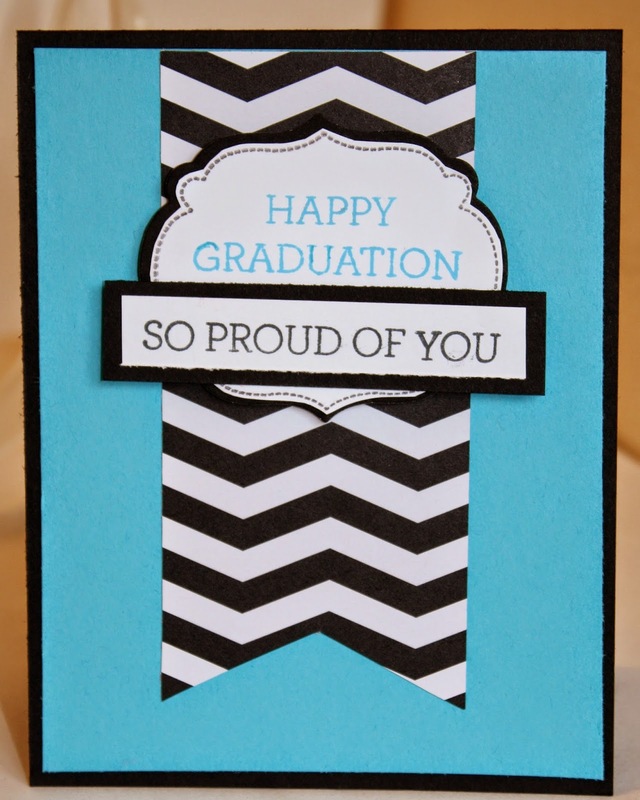 The graduation party invites are starting to roll in and we're up to three so far. So I used the TGIF Challenge#02 here for this card. 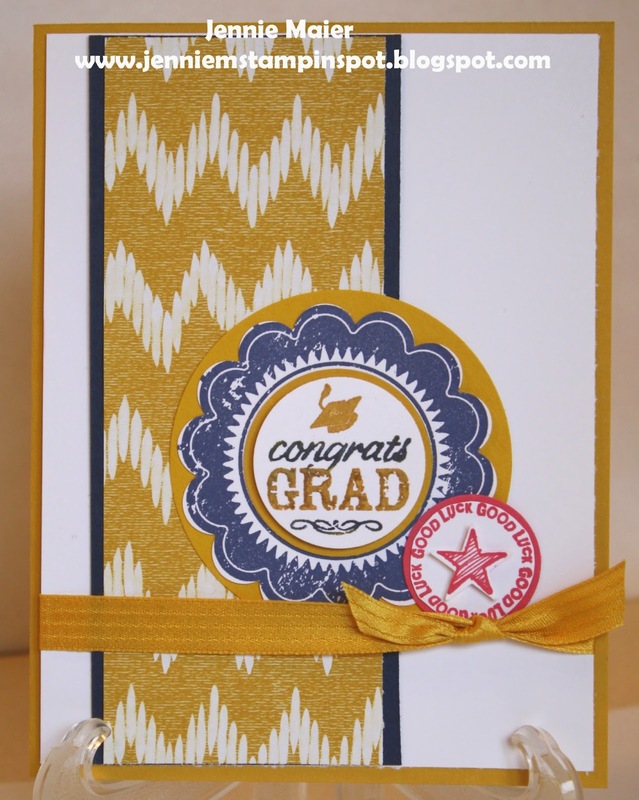 Crazy About You and Memorable Moments (retiring) are the stamp set with some Stacked with Love DSP. So I guess you can tell I'm a creature of habit and love to pair sketch challenges with color challenges. Personally, that jump starts my creativity and I love having a template to start creating! 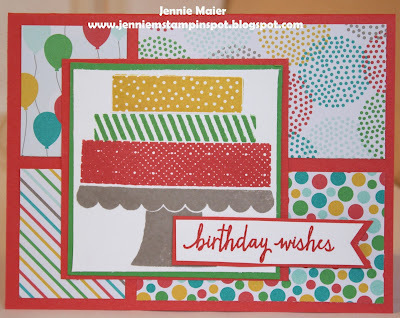 For this card I used the Splitcoast Sketch Challenge#539 here. 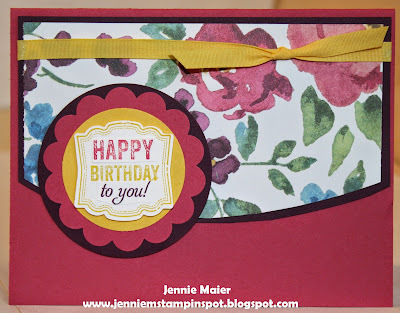 Then the Hand Stamped Sentiments Color Challenge #211 here. The colors to use are Strawberry Slush, Hello Honey and Night of Navy. 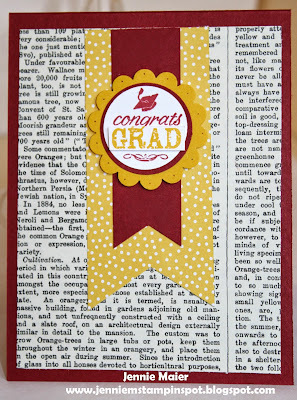 I used three stamp sets, Blue Ribbon and A Fitting Occasion (to retire) and then Something to Say. There's also a bit of Sweet Dreams DSP. 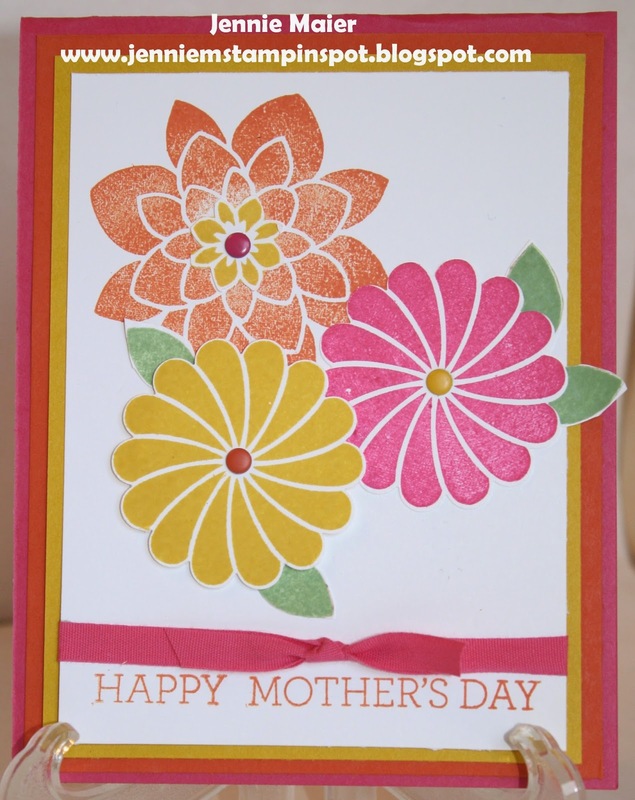 Yet another Mother's Day card for two challenges. First, I used the Freshly Made Sketch#185 here. And then the PPA#250 here. This one is a color challenge to use Coastal Cabana, Hello Honey and Baked Brown Sugar. 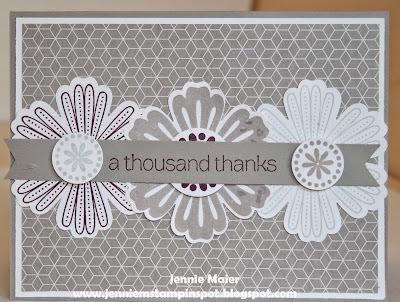 Petal Potpourri and Teeny Tiny Wishes are the stamp sets with a scrap of Moonlight DSP Stack. Here's a thank you using the soon to retire Lots of Thanks stamp set. I also used the MojoMonday Sketch#396 here. And some of the Painted Blooms DSP. Love this bright color combo! I took it from the Splitcoast Color Combination#529 here. The colors are Crushed Curry, Tangerine Tango and Melon Mambo. I also added a bit of Wild Wasabi for the leaves. Crazy About You is the stamp set. I'm combining yet another sketch challenge with a color combination challenge. This one uses the Create With Connie and Mary Challenge#353 here. And then the Fab Friday#63 here. This color challenge is to use the soon to retire In Colors: Baked Brown Sugar, Pistachio Pudding, Strawberry Slush, Coastal Cabana and Crisp Cantaloupe. Embellished Events (retiring) is the stamp set. 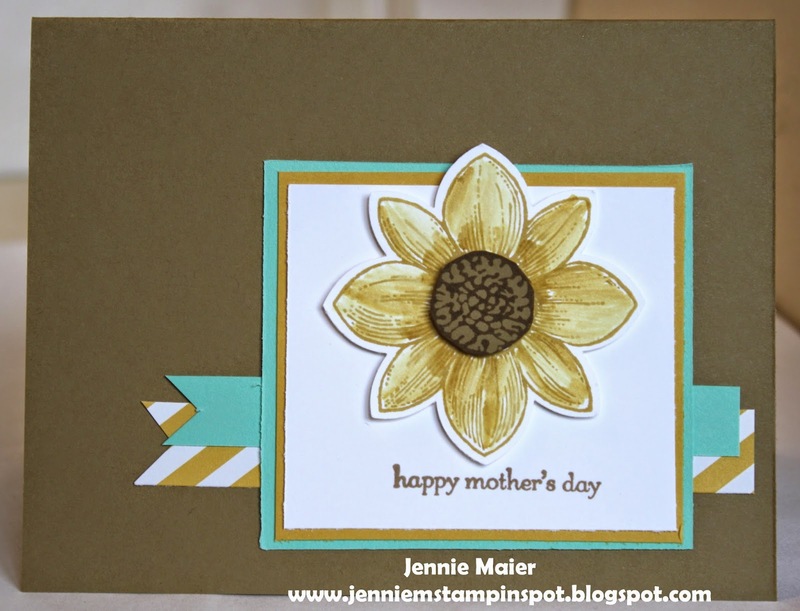 Here's another Mother's Day double duty card. I used the Hand Stamped Sentiments Sketch Challenge#210 here. Then paired it with the new, TGIF Challenge #01 here. This is a color challenge to use the colors Crushed Curry, Calypso Coral and Pool Party. 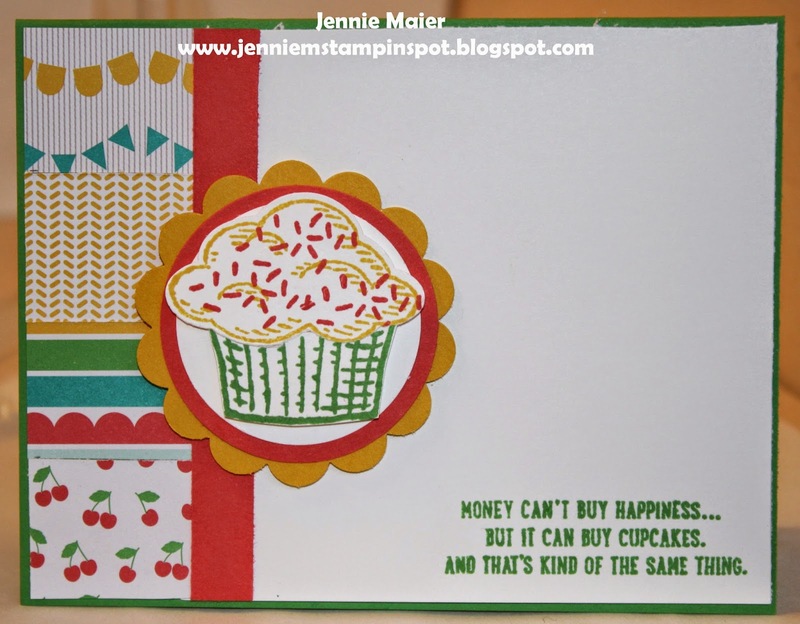 One Tag Fits All, Mixed Bunch and Crazy about You are the stamp sets. This card combines two challenges from Splitcoast. First, I used the Splitcoast Sketch Challenge#538 here. And second, the Splitcoast Color Challenge#528 here. The colors to use are Soft Sky, Blushing Bride and Crumb Cake. I'm not a huge fan of the Subtles but I think this turned out kinda cute. 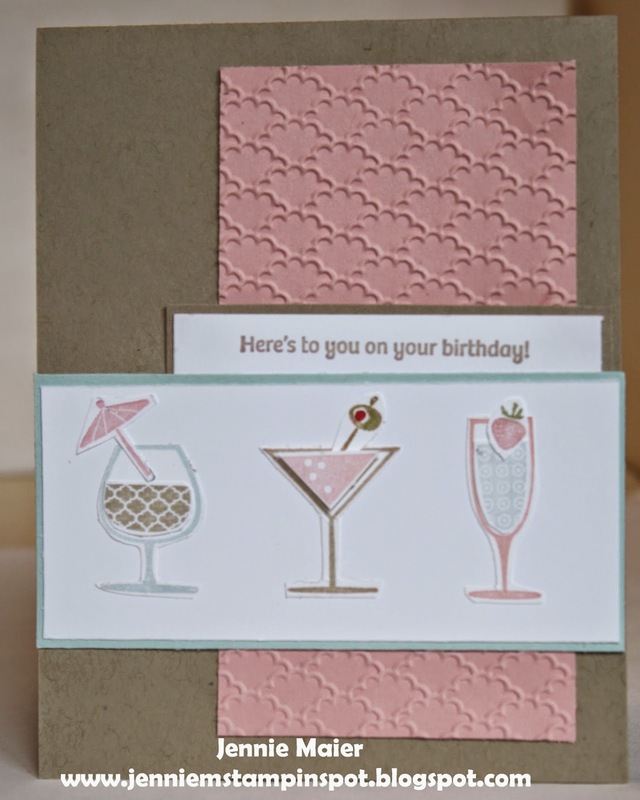 Happy Hour is the stamp set and it's gonna retire.